Campeggio Shamba Holidays si trova a St Leonards, Dorset. Questo campeggio dispone di piazzole delimitate, senza ombra e piazzole poco ombreggiate. Il campeggio dispone di un parco giochi e di un campo sportivo. Ogni anno un ispettore visita il Campeggio Shamba Holidays, controllando oltre 200 tra attrezzature e altri punti di interesse del campeggio. L'ispettore è un dipendente ACSI e non lavora per il campeggio. The campsite is off a very busy road,so road noise can be heard. Excellent facilities ,brilliant staff. But the site is in need of refubishing, as it looks shoddy. We would defiately return. Great site and very helpful and friendly staff. Good hard and grasses pitches. Good clean dog walk off site. We loved this site. It is excellent. Has exceptional facilities. The staff are very helpful & friendly. Good pub/restaurant within walking distance. The advantage of being able to use ACSI. Exceptionally friendly and accommodating staff. First class site with fantastic facilities. We spent a peaceful 2 weeks, but will possibly be a busy site with not a lot of space between pitches in high season. Very Clean site, well maintained, lovely friendly staff, immaculate toilet / shower block and swimming pool. Large fenced off dog walk. Food isn't served every night but plenty of local places to eat. Will probably return every year. Very clean campsite with excellent toilet facilities (heated in winter). Friendly helpful staff and lovely small pool. Only downside for us was that the pool rules of jumping and large inflatables was not adhered to so could be uncomfortable at week-ends when lots of children are there. 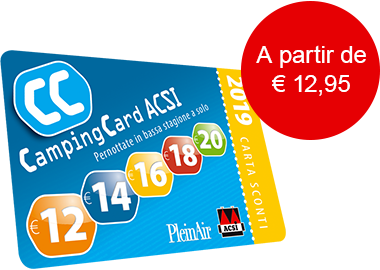 ACSI Eurocampings invia la tua richiesta di informazioni al "Campeggio Shamba Holidays".